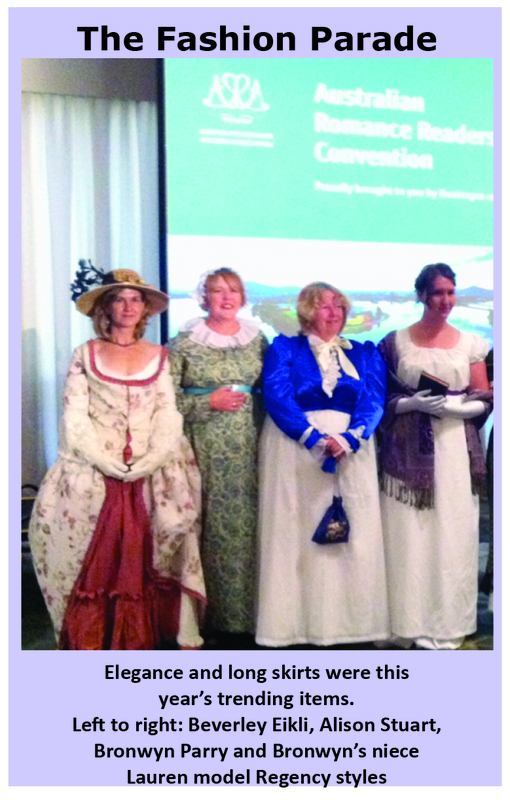 This past weekend in Canberra was my first attendance at ARRA’s biennial conference. 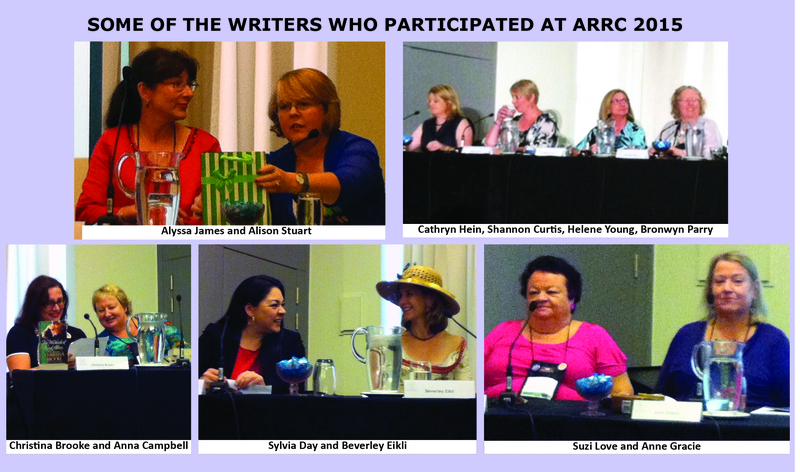 I was starry-eyed with the joy of being amidst romance readers and writers – ALMOST as starry-eyed as I was attending my first RWA conference in Sydney last August! Congratulations to all the winners, including Kylie Scott who was voted Australia’s favourite romance author. Click here for the complete list of winners. Listening to the keynote addresses by Helene Young, Victoria Dahl, Sylivia Day and Kerry Armstrong. Attending all the historical romance panels featuring Anne Gracie, Anna Campbell, Christina Brooke, Beverley Eikli, Ann Stuart, Suzi Love and Alyssa James (I confess to an ongoing love affair with all romances historical, but the panels on contemporary romance and rural romance were just as amazing). Viewing the beautiful dresses and bling on display as the Roaring Twenties took over the Awards dinner (as well as those paraded earlier in the day). 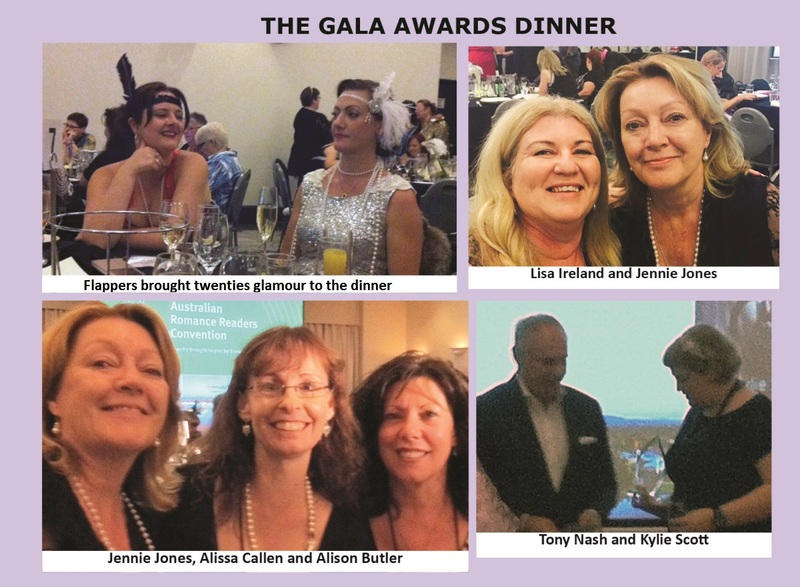 Discovering and meeting new authors including the opportunity to spend the Gala Awards dinner in the company of Jennie Jones, Alissa Callen and Alison Butler. Catching up with RWA member Eleni Konstantine who held the fort at the RWA stand with grace all weekend, with help from fellow committee members Diane Curran, Leisl Leighton and Imelda Evans. Witnessing the generosity of RWA members including Nikki Logan (who sponsored the real coffee kiosk) and Imogene Nix (who sponsored the Romantic Suspense Award). Hearing Tony Nash, CEO of Booktopia, say that they three sold three million books last year, of which 400,00 were romance titles. Doesn’t that make your heart sing? Thanks for the awesome write-up! Was a fabulous weekend.I never knew I was so sporty! Great roundup of an awesome weekend. Loved it all. The volunteers from Australian Romance Readers were so well organized that they should be running the world.